I can’t wait to tell you about my car trips to Florida – they were really exciting. When we go for a car trip – I really love it. I sit on my mawm’s lap all the way. We get to bond all over again. My maw says the next time we take a long car trip she will refer to letsgopets.com because it’s so thorough. It can’t be more thorough than the research that she puts in. She has every stop marked and every dog friendly hotel marked too. ROXIE AT PAWSWAY AND HARBOURFRONT CENTRE, TORONTO, ONTARIO(VIDEOS) – See Roxie at Pawsway taking an Agility Class and see Roxie at Harbourfront Centre. Watch Roxie at the Cavalier King Charles Spaniel Downtown Playday which was held at PawsWay on Auguust 30, 2009. 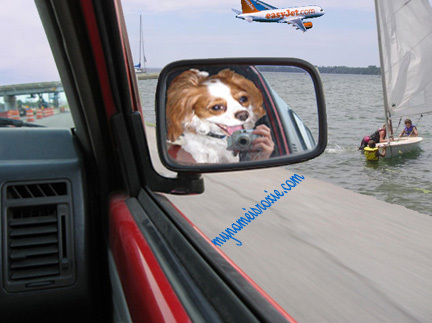 AAA offers Travel Options for the Whole Family … Or Just the Two of You Or, heck, just for you! CAA offers complete travel agency services with over 145 travel agency locations across Canada.